Architects: A.J.N. 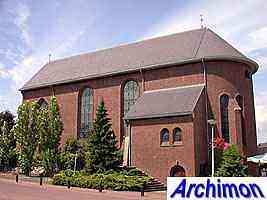 Boosten (1893-1951) Alphons Jean Nicolas Boosten was born on January the 20th of 1893 in Maastricht as the son of a printer. As a young man he worked as a furniture-maker and took lessons in architectural drawing with architect W. Sprenger. 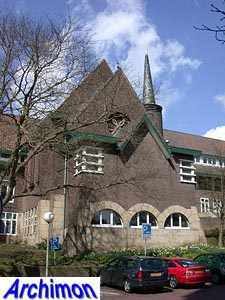 From 1912 until 1917 Boosten was in military service, but he did attend a school for architecture in Amsterdam in this period. 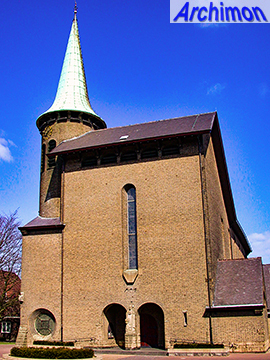 In 1920 Boosten founded a double architecture agency in Maastricht and Heerlen, together with Jos Ritzen, following an assignment for a church in Eygelshoven. In 1924 the partnership ended when Ritzen moved to Antwerpen, although until recently a successor firm existed under the name of Boosten, Rats & Ritzen (now Boosten Rats). 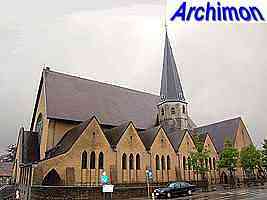 Boosten's next major project is the big dome-church in Maastricht, in conjunction with Ritzen. 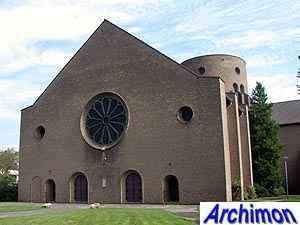 Although the design was executed and praised among fellow architects, it was controversial in conservative catholic circles for being too untraditional. 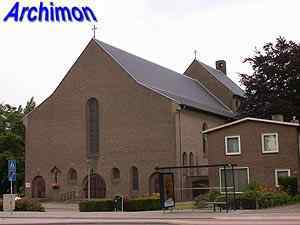 At the same time the church in Eygelshoven was the subject of much criticism as well. 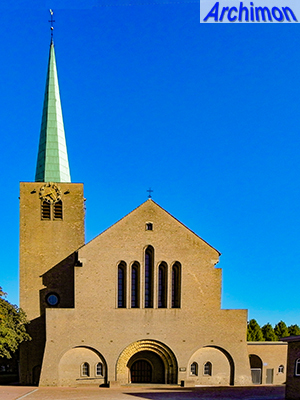 After these churches Boosten didn't get commissioned to build churches for the next eight years, and all assignments for churches after 1930 were for smaller parishes. Starting from that year Boosten developed a very individual and recognizable style, somewhere between Traditionalism and Expressionism and influenced by modern church architecture in nearby Germany and the Romanesque churches of the Maas valley in his province. In a time when this sort of individualism wasn't much appreciated by the catholic church, he managed to get several designs built, although with concessions. A team of artists from the region usually took care of the interior; painters and stained-glass artists Henri Jonas and Charles Eyk and sculptor Charles Vos. 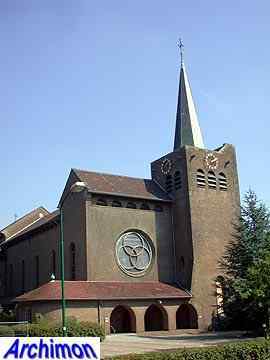 Apart from churches Boosten also designed many profane buildings, both in Expressionist and Functionalist styles. 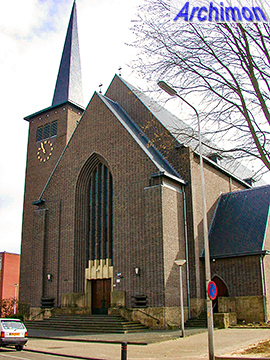 After World War Two, when numerous destroyed churches needed to be replaced by new ones, Boosten became the most successful church architect in his province, partly due to a more progressive attitude by the diocese. On January the 2nd of 1951 he died in hospital during an operation. Several of his designs were completed by other architects like his son Th. Boosten. The following is a still incomplete listing of Boosten's work. The list is probably complete as far as the churches are concerned. House in Expressionist style, designed in conjunction with J. Ritzen. 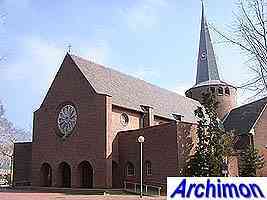 Cruciform church designed in conjunction with J. Ritzen. Use of marl and other natural stone. First design made in 1919. 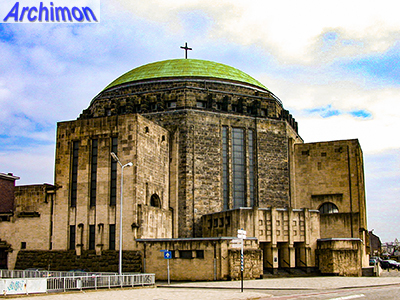 A large dome-church designed in conjunction with J. Ritzen, made out of concrete and covered with limestone and tuff on the outside. The original design included two towers which were never built. The baptistry was built in 1929, in 1953 the entrance and a chapel were added by Th. Boosten and J. Witteveen. A new nave and choir are built square on the direction of the old nave. Of the originally medieval church only the tower, the choir and a few pieces of wall remain. 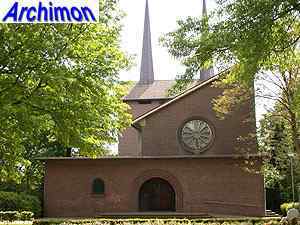 Style similar to that of the church in Eygelshoven. School and convent in moderate Expressionist style. Building in moderate Expressionist style. Damaged by bombs in 1944. The facade was replaced by a new one in 1952, also designed by Boosten. House in moderate Expressionist style. Houses in moderate Expressionist style. New neighbourhood with 524 houses and 3 shops. Building of four storeys in functionalist style. Boosten's first church in eight years. Cruciform church, entirely made of brick, in a style that was more or less prescribed by the commissioners. Cruciform three-aisled church of natural stone. Narrow side-aisles. Square tower with slender spire standing in the corner between nave and transept. Short semi-round choir. House in thatched roof in Expressionist style. 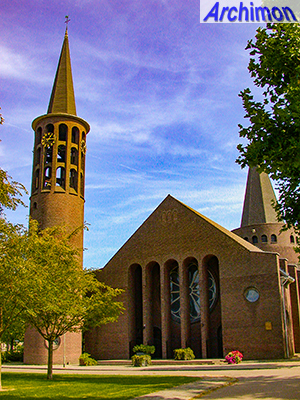 Chapel in Expressionist style with cylindrical tower at the side. Building in functionalist style. Use of natural stone. Church with cylindrical tower and westwork-like front. Narrow windows, low transept. 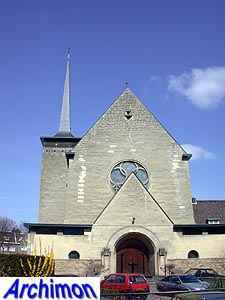 Church with westwork-like front with square tower. Choir with ambulatory. 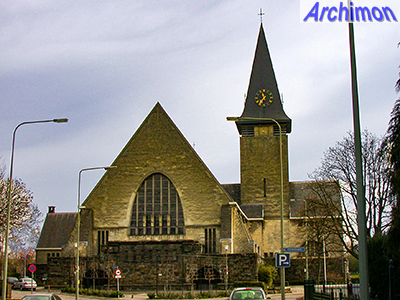 New eastern part for J. Kayser's church of 1876-1877. Hospital of the monastery Broeders van Maastricht. Building in functionalist style. Big three-aisled church, incorporating a medieval tower at its side. Built of yellow brick. Enlargement of an existing schoolbuilding by W.J. Sandhövel from 1928. Church in Traditionalist style, with robust tower. Badly damaged in WW2, restoration completed 1947. Spire added 1956. 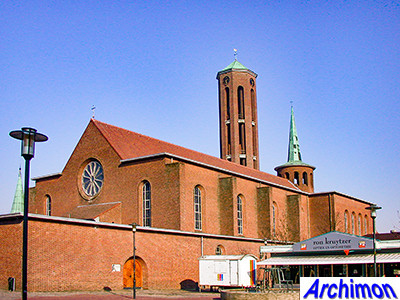 Church in a combination of Traditionalist and neo-Romanesque styles and Boosten's Expressionist approach to architecture. Tall square tower at the front and two smaller cylindrical towers at the back, in the corners between a semi-circular apse and transepts with large circular windows. Basilical cruciform church with westwork-like front and short, massive looking tower. Cruciform church with round crossing-tower and freestanding cylindrical tower at the front. Repairs of war damage. Details unknown. Reparation of war damage. Details unknown. 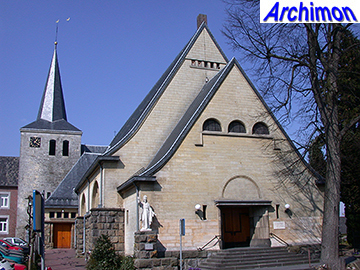 Boosten was commissioned to design a new church to replace a previous one, which was blown up by retreating German troops in November 1944. A first design from 1946 was rejected for being too large, and lacking a village look. The design from 1948 was accepted, and built in 1951-1952, after Boosten’s death. 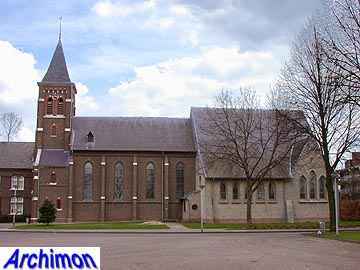 It’s a centralizing church in Traditionalist style, with an arrow-shaped floorplan and a circular tower-like choir. 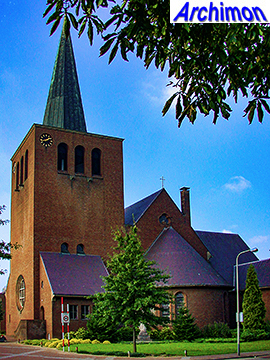 Church in Traditionalist style, replacing a detroyed neo-Gothic church and incorporating a 14th-century tower. One-aisled church with round choir. A planned tower was not built. 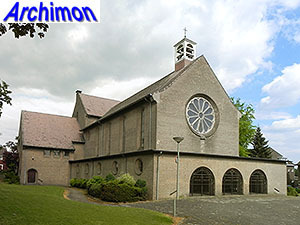 Three-aisled church in Traditionalist style. 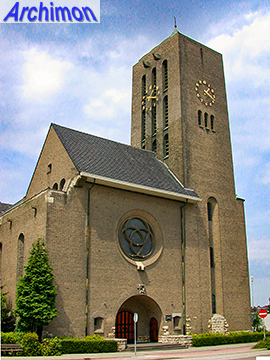 Robust tower, built in 1958, standing next to the choir. 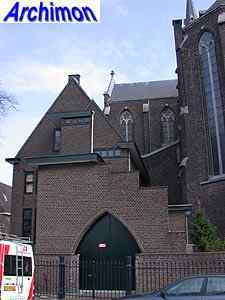 Chapel for the religious order of the Friars of Maastricht. No further details. 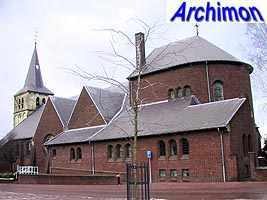 Three-aisled church with three towers, two of which are at the back of the building. The tallest of these (51 m.) is an open polygonal construction, while the other two are shorter and more conventional cylindrical towers, of which the one at the front is a baptistry. Finished after Boosten's death by Jean Huysmans. Cruciform church in Traditionalist style with unfinished round tower at the back. 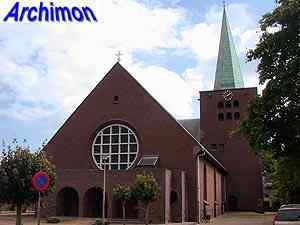 Three-aisled church. A wide, westwork-like tower is crowned by a tall spire. Next to the choir, which is a bit taller than the nave, is another shorter and cylindrical tower crowning a baptistry. Designed by Boosten shortly before his death. Construction was lead by his son Th. Boosten. The tower was built in 1955. 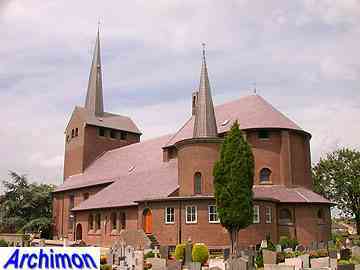 Church with asymmetrical nave and high choir with two spires on top. Designed by Boosten shortly before his death. Three-aisled cruciform church. Built after Boosten's death. Cruciform church in Traditionalist style. Built after Boosten's death.